What is Ballistic Coefficient as it relates bullets? What is Ballistic Coefficient as it's related to rifle and pistol bullets? Well lets just get the standard definition first. The Ballistic Coefficient of an object is a physics term based around a formula that defines how an object will move and act while traveling through space and time. The BC does not affect the gravitationl weak force but rather the bullets ability to move through the resistnace caused by the compression of air around the object, and the flow of that air first around, and then behind. This activity is usually referred to as External Ballistics. Wah? What's that mean in laymens terms? It basically is a way for really smart people to figure out how an object "flies" from place to place. Don't worry you don't have to know how it works, you just need the number. These numbers are readily available and are numbers made public by the ammo manufacturers. The external ballistics are one of the 3 ballistic types (internal, external, and terminal) that are used to define the phsics of the firing of a bullet from the time you squeeze that trigger to the time that the bullets energy is totally spent and the action than energy has on the target. How do I use the Ballistic Ballistic Coefficient to determine a bullets flight path? There are hundreds options out there, but in our opinion software is the way to go. The software available today is amazingly simple to use, all you do is plug in known factors like distance, scope mount height (if any), wind speed, wind direction, and of course that bc number that you've been given by the manufacturers. That data plugged into software properly creates and often charts your bullets flight. Other options include manually calculating the data yourself, and I believe they teach you how to do that in sniper school, but I might be wrong. Ballistic Calculator - use this tool to create a graph and table based off some 2,000 known bullets sold on the market. 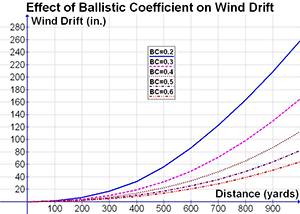 Ballistic Coefficient Generator - this tool is handy for generating a good estimate as to the b.c. of a bullet based of factors like grains, caliber, and bullet shape. Accurate and good for simple estimates, but don't count your life on it, it is a guestimation. FBI Handgun Ballistics - FBI's Handgun Wounding Factors and Effectiveness report written back in July 14, 1989. This is a good summation and contains links to the original. The following links lead to pages with pregenerated ballistic charts creating using our Ballistic Calculator. Check them our or generate your own custom charts and tables.